"Princess of Thieves" is a made-for-TV low budget movie, the title of which might imply it was a sequel to "Prince of Thieves", though the content is clearly not. The plot explores the theme "what if Robin Hood had a child?" 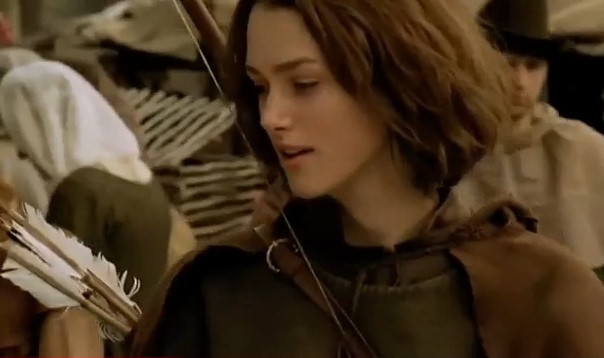 Of course that notion had been addressed before in movies like "Bandit of Sherwood Forest" and "Rogues of Sherwood Forest", but the difference this time is that the child is a daughter. 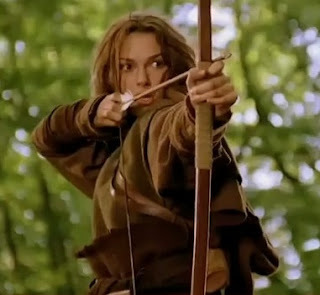 Gwen "Hood" Loxley has grown up more or less neglected by her father Robin Hood whilst he was overseas fighting alongside King Richard. After the death of Richard, Robin returns home to try and ensure Prince Philip takes the throne and not Prince John. When Robin is captured it is up to his daughter Gwen to prove herself to her father. Aimed at a pre-teen / teen audience, the movie is all about the equality of girls, teenage angst, "my parents don't understand me", and unrequited love type references. This would be fine if the result tackled those ideas in anything like as effective a manner as Lucy Griffiths' superb portrayal of Marian in BBC's 2006 Robin Hood. But it does not. At the end of the film Prince John calls to Prince Philip "History will ignore you!" Robin Hood fans will no doubt feel the same about this film, but I concede that on the internet it does have its fans. (Cast list in Comments box).